The oldest of the Italian sheepdogs, the Pastore Abruzzese has been present in its homeland for over 2000 years. The breed is descended from the ancient Alabai and the great white dogs of the Balkans, such as the Merdzan Sarplaninac and the White Greek Shepherd. It is also one of the ancestors of some European breeds, such as the Great Pyrenees and the St.Bernard. A prized working dog for centuries, the Abruzzese Mastiff has an uncertain future, like many other rare Molossers from around the world. Although much older than most Italian dogs, this powerful mastiff is not very well known today. This is due to the 1951 decision of the Italian Kennel Club (ENCI) to breed all of the Abruzzese dogs to a single type under the name Cane di Pastore Maremmano-Abruzzese. 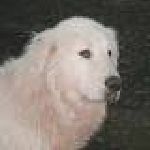 Even though the today's Maremmano-Abruzzese Sheepdog is a direct result of crossing the Abruzzese mountain molossoid dogs with the surviving lupoid examples of the old Maremma lowland breed of Tuscany, it is the only breed type accepted in Italy, as well as the only recognized variety in the rest of the world. It's a similar situation as with the Tibetan Mastiff, Caucasian Sheepdog, Central Asian Sheepdog and so on, in respect that numerous separate variants are being lumped under the same name, while favoring only one of the types. However, this case is slightly different, since many authors actually deny the existence of the breed itself. There are different types of the Abruzzo dogs to be found in the mountain regions, where people are still breeding them, disregarding the decision of the ENCI to eliminate all the types except for the one which corresponds to their master plan of creating a single breed out of two different breeds, the Pastore Maremmano and the Mastino Abruzzese. This mighty Italian Molosser exists in decent numbers and has a loyal following in its homeland, but is disregarded by the official canine authorities in Italy and other countries as simply a variety of the Maremmano-Abruzzese Sheepdog. It should be noted that some breeders of the Maremanno-Abruzzese Sheepdog regularly make claims that their dogs are the same thing as the Abruzzese Mastiff, especially in the West, but this is not only wrong, but also amazing to hear, seing how even the smallest and lightest examples of Abruzzo dogs are much larger than both the original Maremma and the modern Maremmano-Abruzzese breeds. Some of this confusion is created out of ignorance, but much of it is calculated propaganda. The Abruzzese Mastiff has a few regional varieties, separated mainly by coat type, height and temperament, but very much firmly rooted in the same pure breed, as is the case with many other Molossers. In this respect, the breed is very similar to the great Sarplaninac. Some of the types the ENCI and the Maremmano-Abruzzese crowd would seemingly like to see disappear are the Abruzzese Marsicano, A. Peligno, A. Aquilano, A. Pezzato, A. Baffuto, Abruzzese de Pascocostanzo, Abruzzo della Maiella and others. We can only hope that this wonderful Molosser, the one and only Abruzzese Mastiff survives and makes a comeback, for it is truly a great ancient dog. It is interesting to note that some people even consider the Mezzocorso to be a subtype of the Abruzzese Mastiff, which is a breed that even though related, is still a very different dog. The Abruzzo is a giant breed, used for guarding property and protecting livestock from wolves and bears. Thanks to its legendary courage and power, it was even used as a large game hunter in the past. This rustic Molosser isn't suited for the role of an urban pet, due to its unfriendly attitude towards other dogs and distrust of strangers, but its intelligence and loyalty make it a good companion to experienced owners. It is very territorial and protective of its master's family, making a good guard dog. The head is large and wide, with a strong muzzle and jaws. The body is broad-shouldered and muscular, with a deep-chest and sturdy legs. The coat comes in a few lengths and textures, from richly longhaired examples to medium length and short-coated dogs. There is also a bearded variety, as well as a rare curly-coated Abruzzo type. The only colouring accepted is pure white, coming in pearl or ivory shades. In the past, the height was reportedly 35 inches, but in modern times, the majority of working specimens are averaging around 30 inches at the withers, although on occasion taller, as well as smaller examples can be encountered.